Hi Barbie – When you were here on Tuesday I told you my ideas about the make-over for that corner bed next to the entrance. (The one I used to like and now really dislike). When the rest of my garden was a complete mess, this one had something nice about it (though when I look at it now I’m not really sure what it was I liked). I can’t find any photos of it before the tree was this big, it probably looked better then. Anyway, as we both agreed, the tree actually had to go. It made that whole area very dark, was not attractive and the area was infested with slugs and snails. Last year when the tree was smaller, at least the lilies and tulbaghia flowered and it looked quite nice(ish), but this year the deep shade and mess it was causing made everything so dark in there that nothing was happy anymore. The lilies never flowered, the Tulbaghia were falling over and not flowering, none of the annuals I planted in there grew … no amount of TLC was making any difference and to top it all, the tree made an incredible mess. Everywhere. So … regretably, this tree finally had to go and on Thursday the deed was done – and I didn’t cry this time . Here are the pics of before and after. 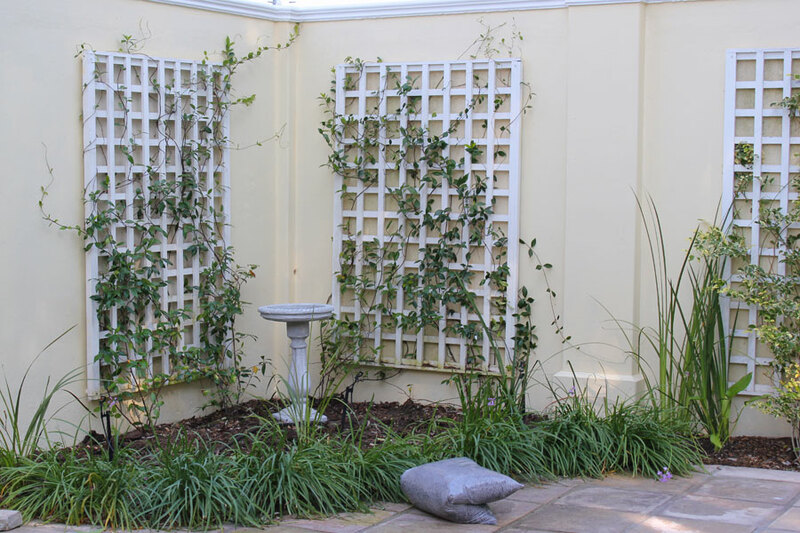 We’ve kept the Star Jasmine growing on the trellises, I added the bird bath which was intended for the back garden (not sure if it will stay here though), left the Tulbaghia (not sure about those either) and moved all the shade plants to the back where they filled in some gaps. Here are the “before” and “after” pics (click to enlarge). I would love to make this a gorgeous, flowering garden and as it gets lots of sun now I think I may have many options. I’ll need to do lots of reasearch and planning before I can go shopping for plants though … I want to get this right as it will be my very first “garden design” project I do all by myself. 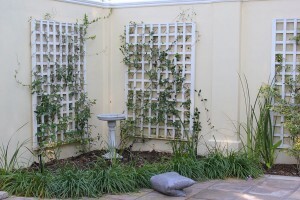 The only thing I don’t want to change is the Star Jasmine creepers – I love those and now that they get plenty of light I think they will fill the walls beautifully. For this weekend my plan is to add compost to the soil, clean up the area, get rid of dead leaves etc. and start planning … Any suggestions and advice will be MOST welcome! Have a happy weekend and don’t work too hard. Trying to keep it alive just seemed to be the only thing I could think of..I didnt mind of course. But it is the truth. I also worry about killing plants…sometimes even weeds…sometimes. I try so hard sometimes. Love all the new photos and posts. It really makes a difference with it all opened up. Now your flowers will have a chance to shine and be the focal point. Wow, looks great! Love the after picture. Nice work. Can’t wait to tear out some of my trees, fences and yard this weekend. thanks for the motivation. Considering it – but with my brown thumbs, might not be the best choice. Mabe an “easy to manage” free flowing type. Not too ornamental. I like the slightly wild looking rose bushes. 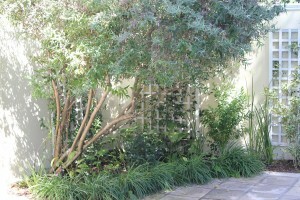 Removing large plants that have been there for a while is always traumatic, but change in a garden is good! I have only one suggestion: a large, colorful ceramic pot, possibly with a small tree in it, or better yet, a tall ornamental grass or some bamboo. Something that won’t overwhelm the space like the old tree did, but also gives you another vertical element and some instant greenery, plus some contrast with the vines. I’d also think about removing some (or all) of the greenery in front (is that the Tulbaghia? ), or maybe breaking it up so it’s not a whole “wall” of them. Hi Alan – Thanks for the advice! I like the ceramic planter idea and especially like the bamboo idea – I do love bamboo. Yes that green “wall” is the Tulbaghia – its indigenous (wild garlic). I’ll get hammered by the locals if I turf it – but I’m thinking of moving it or at least thinning it. It used to be the best thing about that bed – now of course – not so much . Any suggestion of the type of bamboo? Which bamboo would you plant? What bamboo *wouldn’t* I plant? I’m not really sure of your climate, so need some more info. How hot does it get in the summer? Does it get very humid? How cold does it get in the winter? Do any of the local garden centers carry bamboo? Sometimes that helps determine which grow well in your area, although sometimes they can get it wrong and carry plants that won’t do so well (as I’ve painfully learned before I knew anything about bamboo). Message me on Blotanical and we can finish this discussion there. What a difference that made! I think you’ll have a lot of fun shopping for plants to now fill up this beautiful space. Lovely transformation Christine! It is too bad about the tree. I agree you made the right choice. I would only suggest to leave the dead leaves. Maybe crinkle them up a bit, for they offer valuable nutrients to the soil. 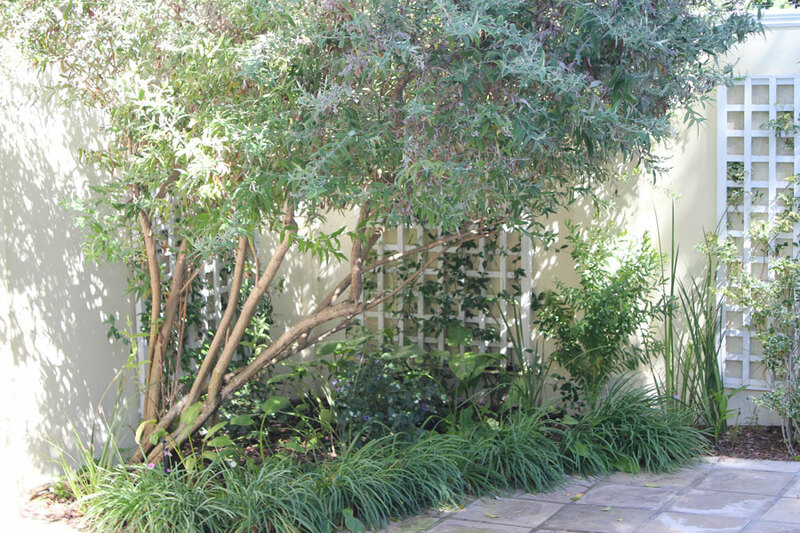 Sweet corner of your garden. Thanks Carol, that does make me feel better. I worry so about “killing” plants. Crazy, I know, but it wasn’t working for me anymore. Thanks for the reminder re the leaves – I will leave them. I’ll cover them with compost just to make it look neat for now.